One dry, snow free day last week, MRIS released its data for November signed sales contracts for existing home and condos in the District. As in the reports for the preceding few months, sales and dollar volume are waaaaaaay up and prices are lower than the same period last year. More is selling, but for less. I must re-repeat: remember that we're now into the one year anniversary of the financial collapse kindly brought to us by the Bagatelle-brunching-bonus-bagging idiots who work on Wall Street so YoY numbers right now (sales and dollar volume) reflect the effects of last year's near economic meltdown. YoY, November was simply a blowout month. Aggregate dollar volume leapt 83.46%. The number of units sold almost doubled, up 98.08%. Condo dollar volume more than doubled, hurtling 109.85%. Home dollar volume was respectable, too, surging 70.2%. Condo sales volume was full or vim and vigor, too, bounding 118.25%. Home sales volume was no slouch, popping tall at 82.39%. However, prices continued their downward spiral. Average prices fell 7.38%. Condo prices fell 3.85%, while home prices stumbled 6.68%. 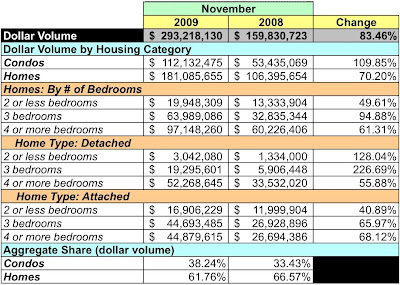 Only 4 bedroom homes experienced an increase in average sales price YoY, up 3.93%. One thing that struck me is that the market doesn't seem to be behaving in a textbook manner. Eevery month since May there's been a 5-6 months supply of housing inventory listed and in November it shrunk even more to 4.44 months for condos and 5.15 months for months. Both metrics indicate a tightening supply of housing on the market. Yet prices still fall across the board, condos and homes. High demand and less supply don't normally equate to lower prices. So what's going on? Very strange indeed. 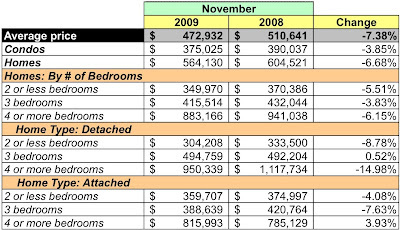 Seeing a lot more houses move but at lower prices...the DC market is still holding in pretty well. Particularly with DC unemployment going up I wouldn't expect seeing so many houses sell. Maybe all of the Federal government hiring is boosting sales in close to DC's center? The burbs still seem to be getting crushed. Eevery month since May there's been a 5-6 months supply of housing inventory listed and in November it shrunk even more to 4.44 months for condos and 5.15 months for months. Both metrics indicate a tightening supply of housing on the market. Yet prices still fall across the board, condos and homes. High demand and less supply don't normally equate to lower prices. So what's going on? Same thing happened in NOVA - we saw under 6 months of inventory for a while before prices went up YOY. So I would suspect the same thing here in DC. Like we now see in N. VA, look for DC to start posting YOY price gains in the spring or so.